It rained for 45 days, and the whole earth was flooded. All the people were destroyed, except for one old man atop Spirit Mountain. Many days passed and a dove brought him instructions from the Creator to drive a ram's horn into the earth. The old man obeyed and the waters were drained. He sent the dove forth, and when it returned with fresh grass in its beak, he rejoiced for the land had become dry. The land became irrevocably "not good" by this act, and younger-brother led the people "across the water" to a new land in the east. Overcrowding soon ensued, and younger-brother chief dispersed the people into three major people groups (Navajo, Mojave, and Hualapai). This is the Flood story of the Hualapai Indians of northwestern Arizona.1 Like hundreds of Flood traditions, it was apparently handed down orally over the centuries. The Hualapai account corresponds to petroglyphs--one depicting a vessel carrying eight people (including younger-brother chief) across the floodwaters--inscribed on the flanks of Spirit Mountain in the area of Davis Dam, California, near the Colorado River. 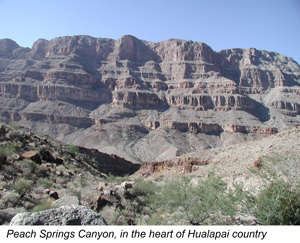 Some of the finest rock strata evidence we have for a global Flood is found on Hualapai lands in the westernmost Grand Canyon. Research by ICR geologists has been carried out there for the past ten years with the kind cooperation of the Hualapai. On these lands, song, rock, and petroglyphs agree--on a global flood. Obviously the dove, the 45 days, the eight people aboard a vessel of deliverance, and a fall that marred even the animal kingdom, bear a remarkable resemblance to the biblical account. One might suspect it was a corruption of the Bible story, but this is unlikely for three reasons: 1) it is at least 150 years old, pre-dating all but the earliest Christian influences; 2) the Hualapai are fiercely proud and, for the most part, eschew "white man's" ways, including his religion; and 3) it matches with petroglyphs known to be ancient (though they cannot be absolutely dated). The account appears authentic. Jesus was not white, nor did He found a "white man's religion." God loves the Hualapai and sent His Son to earth to prove it. This is a love story begun in the book of Genesis, and the modern Hualapai retain a memory of the events recorded there. Paraphrased by the author, based on the story in the following publication: Talieje, Paul. 1984. Wikahme. In Hinton, Leanne and Lucille Watahomigi (eds. ), Spirit Mountain: An Anthology of Yuman Story and Song. Tucson, AZ: Sun Tracks and the University of Arizona Press, 15-42. Cite this article: Hoesch, W. 2008. The Hualapai and the Flood. Acts & Facts. 37 (1): 16.